Biomanipulation – A Fishy business! We successfully appointed Land and Water Services Ltd (LAWS) as our sediment removal contractors. They’ve already mobilised an impressive site compound and are looking forward to “going afloat” next week. We also have a live website www.hovetongreatbroad.org.uk! This is a huge achievement for the team and provides us with a web “home” for the project. A massive well done to Doo, and a big thank you to GRIT Digital, for creating a fantastic site perfect for the project. Karen Lunan, our LIFE monitor, joined us yesterday and was pleased with our progress so far and especially impressed with Julia’s precision and attention to detail with the financial reporting. Sediment Removal – Our kick-off meeting at the beginning of January was a great success. We now have a good plan for our first season of sediment removal and are ready to start seeing some diggers and sausages (geotextile tubes) on the broad. Fish Surveys – Steve Lane and his team from the EA, along with Fishtrack, completed the autumn fish surveys at the beginning of November. 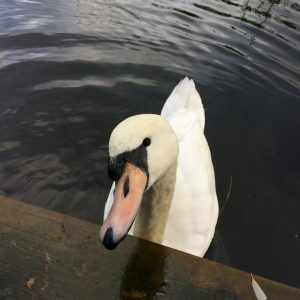 Despite the cold temperatures, strong winds and torrential rain at times, the surveys went well, made all the smoother by much-appreciated assistance from Tim and Patrick from CST as well as Sam the Swan’s company in Hoveton Little Broad. Web presence – We aimed to reach 400 followers before Christmas, only 6 months after we launched our twitter account @Hoveton_broad at the Norfolk Show. We had roughly 450 followers by Christmas and we’re now well on our way to 500 with new followers almost daily. We’re hoping that this will continue to increase with the launch of the website. 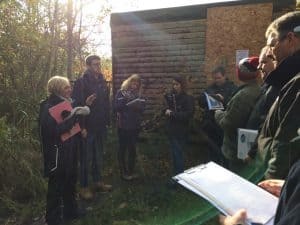 Signage – Doo and Rhiannon took 10 potential signage contractors to the Nature Trail in early November to show them the “wildness” of the site and so they could understand the limitations with regards to installation. Of course they all loved the Nature Trail and they sent in some excellent tenders. The successful contractor was Landmark. We’ve already seen some first draft ideas and are looking forward to creating “mock-up” signs to see what they’d look like on the trail. We’re also working with local illustrator and graphic designer Fiona Gowen to create some beautiful maps for the signs and leaflets for the Nature Trail. She’s worked for some top clients: National Trust, RSPB and Cambridge University Press to name a few, so we’re excited to see what the finished products will look like. 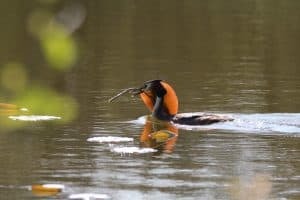 Great Crested Grebe in The Broads, taken by P Ray, a Natural England Volunteer. We have lots booked in the diary for the coming months. Ruth, our volunteer from UEA, starts with us on Monday to complete an “industrial placement” year for her Biological Sciences degree. Some of the Severn Rivers Trust (a LIFE and HLF funded project working in the Severn Catchment) team are joining us for two days next week and Chris will be presenting something “fishy” at this year’s Lakes Network meeting in Kendal at the beginning of February. Finally, as soon as sediment removal has properly begun, we’re hoping to hold an emergency exercise with LAWS and the local emergency services on Hoveton Great Broad. It should give Natural England and the contractors a sense of what would happen in a real-life emergency situation, and give the emergency services an excuse to get out on the water. Now your bit: please share our website www.hovetongreatbroad.org.uk far and wide and check back regularly to see what changes we’ve made and read about what’s coming up. We want this to be one of the top hits on Google (other search engines are available) so that people find our page first when they search for the project. Hoveton Wetlands Restoration LIFE+ project is generously supported by the European Union LIFE+ Nature and Biodiversity Programme. Bringing the Broads back to LIFE: LIFE14NAT/UK/000054. Natura 2000 - Europe's nature for you. The sites benefitting from this project are part of the European Natura 2000 Network. They have been designated because they host some of Europe's most threatened species and habitats. All 27 countries of the EU are working together through the Natura 2000 network to safeguard Europe's rich and diverse natural heritage for the benefit of all.